We aren’t in the business of stock designs for outdoor spaces. Each project, like each owner and property, is one-of-a-kind. That’s why we work so hard to customize every landscape design with our client’s vision in mind. Investing in a major renovation of your outdoor areas can feel overwhelming. We are committed to being completely up-front and transparent about our process so that you can feel confident that you know exactly what you’re getting, at exactly what value. Our unique landscape design process begins before we ever put pen to paper. Read below to learn more about our design process. For us, the most important step is our initial meeting with you at the site. This is when we get to know you and learn about your vision. You’ll probably have a lot of questions, and so will we. Together, we’ll talk about your ideas and visions, as well as other possibilities and options. Is there a feature in your current space that you want to incorporate into the design? If you have children who absolutely love playing in their sandbox, we’ll include a special spot for it in our custom plan. If you have a memorial tree you planted when you first moved into your home, we’ll find a way to showcase your history. Do you have any favorite plants or materials that you’d like us to use? If you’ve got your heart set on a particular kind of tree, flower or bush, let us know. We’ll work with you to make it happen (or be honest with you if your dream plant won’t hold up to Minnesota winters). We can also offer alternative or complementary choices to expand on your ideas. Do you have any health or safety concerns that would affect the design? If you suffer from hay fever, you might be wary of some plants. If you’ve got a pet that loves to explore the great outdoors, we’d want to make sure not to include anything that might be harmful to them. If you’ve got small children, no-slip brick might be a high priority for you. Let us know about any concerns up front so we can address them. How much does maintenance factor into your landscaping vision? Maintenance is an important part of property ownership, and we know you’ve got a lot on your plate. Tell us if you love working in the yard or if you’d rather go with something a little more hands-off. We can suggest the right materials and plants for you, and we’ll be glad to tell you about our landscape maintenance services. How do you plan to use your new landscape? Good landscaping is something to be appreciated and enjoyed. Whether you plan on throwing cookouts in the summer, watching your kids play tag in the yard, or you just enjoy sitting outside to read a good book over a cup of coffee, we can help you come up with a design that will withstand the wear and tear of everyday use. Your input is our most valuable resource when it comes to creating a design you’ll love. This meeting is also our chance to introduce ourselves and show you a selection of our best work. We believe the quality of our past custom designs speak for themselves and set us apart from from our competition. Feel free to ask any questions about us and our company. We want you to feel fully confident that we are the right fit for creating your new outdoor space. Both budget and regulations affect our design and the materials we suggest. That’s why, before beginning any project, it’s important that everyone is on the same page about budget. We want to meet your expectations without breaking the bank. Hitting regulation snags in the middle of a project can cause undue time, stress and money. We’ll take care of researching everything for you before we start creating plans so you won’t have to worry about complications arising due to zoning restrictions or rules set up by your local Homeowners’ Association (HOA). You can be sure that whatever we propose is in line with all applicable regulations. After the initial consultation, it’s time for us to get back to the office and boot up the computer. Once we have all the necessary information about your property and your vision, and when you’re ready to move ahead, we will start crafting your unique outdoor space. We use DynaSCAPE, a dynamic landscape design program that’s the choice of thousands of professional landscapers, colleges and universities. DynaSCAPE allows us to provide you with a detailed, fully colored plan that is drawn to scale. The result is a precise, artistic rendition of your outdoor landscape that you’ll think was hand drawn. An optional 3-D rendering of your design is also possible. In addition to your colored design layout, we’ll also provide you with an informational guide that details all the materials we’ll be using in our landscape plan, as well as care instructions for each plant we suggest. 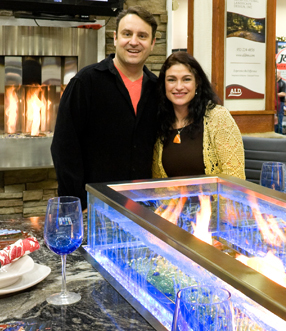 We’d love to sit down with you and talk about the vision you have for your outdoor area. We can only work with a few client each season, and there’s no obligation for our initial consultation, so call us at 962-224-4865 or email us to get in touch or schedule a consultation. A: No, we believe that obligation-free is the way to go. The initial consultation is completely free of charge, so there’s no pressure on you to make snap decisions. We want to make sure we can work with you to create a custom design that incorporates all of your ideas within your budget. While we would be sad to see you go, if you decide we’re not the right fit for you, we are happy to recommend someone who might be. A: Yes, there is a fee for our designs. If you don’t like our design or we are way over budget, we may off a refund of the design fee in good faith that our design will not be going out to bid with other contractors. This is how we reduce liability risks and you get a better managed project. We love what we do and we want to work with you to see your project come to life, from beginning to finish. Q: Is a full design needed for every project? A: We don’t believe in winging it when it comes to landscaping installations. Some smaller projects with fewer details may not warrant a complete computer rendering, but the majority of our projects start with a full design. Having a full plan helps us all stay on track as we work toward the same goal. We want to be sure no detail is overlooked and that your outdoor area looks exactly as you expect. A full design serves as a guideline for our crew and facilitates a smooth, on-time installation. If there are other questions we haven’t answered here, please don’t hesitate to ask us!